I had lost my job in 2009 when the recession hit and we had been thinking about moving abroad. We went along to an exhibition in Dublin and met employers from all over the world trying to tempt us to move. It was at this exhibition that I was offered a position in Canada. We decided to take the plunge and pack up and head off. We moved out of our rented apartment and managed to squeeze the rest of our life into two suitcases ready to embark on a new adventure. We couldn’t wait. We landed in Toronto in June 2009 and quickly settled into the swing of life. We rented a house and quickly our two suitcases began to grow and grow. The years seemed to pass by quickly and before we knew it we had a house load of items, two children and an ache to move home. Now the big question what do we do with all our items? We had furniture, clothes, toys, buggies. You name it we had it. 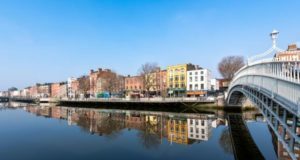 We found a company who could ship our items for a fee but where do we put it once it gets to Ireland? We went online and the first thing that popped up was Space Storage. We knew we would need a large space as once we began packing, our items seemed to grow in size. We requested a quote online and within a short time we received a call from Darren in the office. We advised that we could not give an exact date that we would be moving in as the shipping company had advised that the date would all depend on travelling time and conditions. Darren explained that this was no problem as with a small €30 deposit he could hold the unit for one month for us. Over the phone we explained all the items we had and Darren was able to advise us that we would roughly need a space measuring 150 square foot . He advised that if our items showed up and needed more that was not a problem either. He could even contact my parents when the shipment arrived and they could be there to oversee the items going into the unit. He even advised that they sold locks for our unit there so there was nothing further for us to worry about. He gave us plenty of options for paying online on the Space Storage website, or setting up a direct debit or card authorization. He had it all arranged within one phone call. So here we go on another adventure on our journey home, thanks Space Storage. Hope you enjoyed meeting some of our customers.